Nearly 8100 pilgrims from Jammu and Kashmir would perform Haj this year and the first batch which is carrying nearly 800 passengers, has left for Saudi Arabia today. 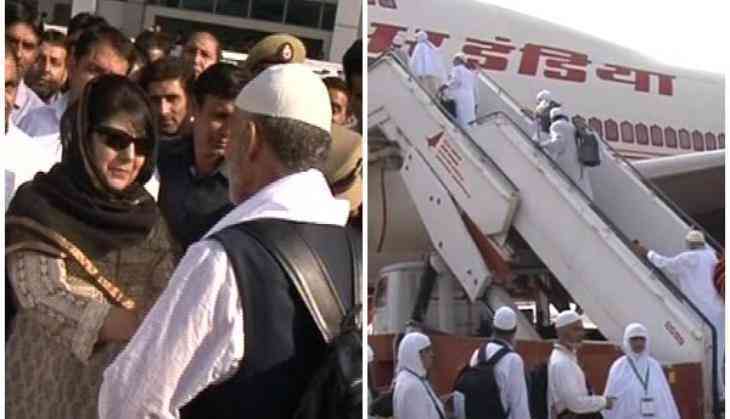 The annual pilgrimage of Haj begins today and eight hundred and forty passengers left from Haj House in Srinagar to board a flight to Jeddah from the Srinagar Airport. Speaking to ANI, Qamar Sajad, Chief Executive Officer HAJ Committee Srinagar, said, "As many as 8,100 pilgrims will perform Haj this year, for which the first batch in two flights will depart from Srinagar airport to the holy city of Jeddah in Saudi Arabia. This process will continue till August 3,"
Sajad also said that different arrangements have been made this time, with special arrangements being made for people and high-end vehicles being hired for convenient travelling. Even the pilgrims travelling to Haj seem to be satisfied with the arrangements made. "We are very pleased with the arrangements made. The helpers are helping us. There are separate provisions for women, I pray to Allah that all of us have a safe and successful trip", one of the pilgrims said. Last year, nearly 6500 people travelled to Haj, but this time the Haj quota for Jammu and Kashmir was increased. According to Islam, it's compulsory that Muslims must travel to Hajj at least once during their lifetime. READ NEXT >> TKSS: Is Sunil Grover becoming the new Kapil Sharma of Television?